We take you back in time to highlight the journeys of two immigrants: Johan Helmich Roman, a court musician who rose to become Sweden’s “Handel” and left a musical legacy in the Swedish royal court after living in London and returning back home to the motherland; and, Julius Thor Westerberg, a native of Gothenburg who immigrated to Chicago in 1894 to work on the farms and eventually pastor the Swedish Methodist congregations in Andersonville. This is the tale of Johan Helmich Roman’s journey. Born into a musical family, Johann Roman was taught lessons on the violin and oboe by his father who was a member of the Royal Court Orchestra of Sweden, named the Hovkapellet. The musical culture was rich with the French and German styles, and the court was filled with the music of one Anders von Düben, who studied in Paris and brought back all he learned to Stockholm. It wasn’t long before Roman would also become a composer himself and have the lead musical position in court. When he arrived in London, Roman was “quickly taken up as a violinist at the Opera” and employed in the King’s Theater, one of the top opera houses in all of Europe. Under Handel’s direction, Roman was the only Scandinavian employed in one of the most prestigious orchestras in all of Europe. Roman watched Handel lead his epic premiere of his opera, Radamisto, from the harpsichord, and it’s said that Roman also took basso continuo lessons from him as well. Regardless, Roman got to watch and soak in Handel’s harpsichord and basso continuo techniques every night at the opera house. As much as Roman wanted to stay in a vibrant music scene among the top performers, the Royal Court of Stockholm was calling him home. With the sudden death of Charles II and new election of King Frederic I, the court music scene was in shambles “in a state of much decrepitude” as Roman himself put it. 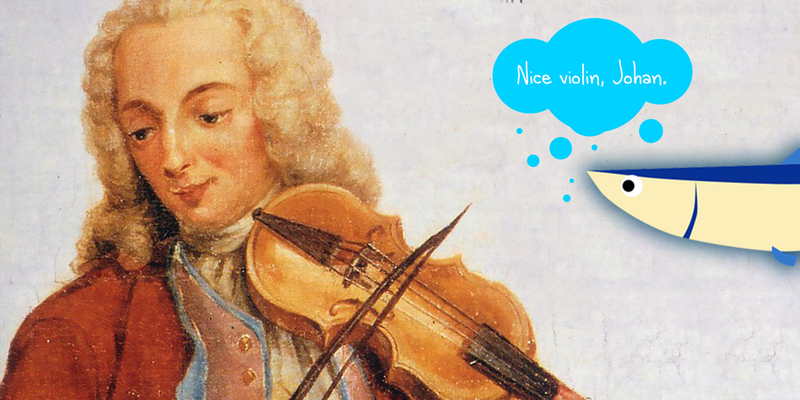 But, he returned as a much more skilled violinist, leader, and composer, and right out of the gate composed an abundance of tribute music, including his Golovinmusiken in honor of the Russian ambassador Golovin who visited Stockholm in 1728. Dubbed the “Father of Swedish Music” and “Sweden’s Handel” Roman received yet another opportunity to travel abroad in 1735. For two years, he traveled all over Europe and gained proficiency in English, French, Italian and German. He brought back a wealth of his own instrumental music, and in 1744 celebrated the arrival of a new royal couple who would change everything for the music at the Swedish courts, Adolf Frederick (not Frederic I!) and Louisa Ulrika who loved music and played cello and harpichord, respectively. He composed Drottingholmmusiken in their honor. However, even in the highest of times, tragedy can strike. Roman was made a widower not two months before those celebrations, and was granted a paid leave of absence following those celebrations. By 1752, he was in Haraldsmåla where he spent his final years “in the wildnerness”. The following was contributed by Kurt Westerberg about his paternal grandfather, Julius Thor Westerberg. Working in Chicago – this reflects my grandfather’s early jobs in Chicago that included working on farms and working in a coffee packing plant; it also reflects on the history of Swedish immigrants playing an important role in building Chicago after the Chicago Fire. Conversion on a Train – while taking a train from the Des Plaines Campgrounds back to Chicago, TJW experienced hearing a “rowdy” group of passengers singing bawdy songs and drinking and also hearing another group of passengers singing hymns. He joined the latter group and viewed that as a significant conversion experience. In addition to the music, I have asked my brother to translate portions of the autobiography into Swedish and record those portions that will then be heard in the background during different sections of the work. Kurt’s piece was commissioned by the BBE as part of its 2018 Chicago Stories project, an annual new music program that sets the stories of Chicagoans, Chicago neighborhoods, and Chicago communities to music. Leighann Daihl Ragusa is a traveso player who loves Portillo’s but not Chicago-style hotdogs, doesn’t watch sports, and is crazy for Giordano’s. Read more about her and her Chicago Story here. Paul Von Off is a sackbut player who loves the stars, the Blackhawks, and Giordano’s. Read more about him and his Chicago Story here. Kurt Westerberg is a composer with ties to Rogers Park, loves the lake, and cheers on the cubs. Read more about him and his Chicago Story here. Katherine Shuldiner is a gambist who lives in Andersonville, loves the Botanical Gardens, and is down for a Chicago-style hotdog. Read more about her and her Chicago Story here. Regina Harris Baiocchi is a composer who loves Tuscany’s on Taylor, loves the Sox, and is a proud South Sider. Read more about her and her Chicago Story here. Ronnie Kuller is a composer who loves the Bloomingdale Trail, lives in Old Irving, and cheers on her favorite sports team: The Joffrey Ballet. Read more about her and her Chicago Story here. Felicia Patton is a vocalist who went to North Park University, eats at Girodano’s, and still calls it the Sears Tower. Read more about her and her Chicago Story here. Laura Osterlund is a recorder player that loves the lake, Ann Sather, and Chicago-style hotdogs. Read more about her and her Chicago Story here. Can a Christmas carol be controversial? The creator of "Hark how all the Welkin rings" certainly wasn't too happy when a revised version became of his text came out. Find out more about all the poetic shade that was thrown with Leighann Daihl Ragusa, curator of the BBE's 2017 Carols program. What is Wassailing? Is it a type of boat? Is it the past tense of a verb? Actually, "wassailing" can mean several things, though most of them seem to revolve around food or beverages. (We don't object.) Learn more about wassailing - and how to brew your own wassail drink! - with Leighann Daihl Ragusa, curator of the BBE's 2017 Carols program. We think that carols belong exclusively to the Christmas season - but that's not true! For centuries, we sang carols during all four seasons, at weddings and birthdays, and during other holidays and occasions. Even the Christmas carols we know today, well, they’ve gone through some changes. Learn more about the history of carols with Leighann Daihl Ragusa, curator of the BBE's 2017 Carols program. Everyone has one and uses it, but there are few who can *really* make it sing. Join us as we ask Alexandra Olsavsky and Thomas Alaan what it takes to be a singer. This predecessor of the piano is probably the best known early Western musical instrument known to modern audiences. Join national treasure David Schrader to learn more about the harpsichord! It’s true. Most people associate recorders with screeching, neon-colored plastic instruments. But listen to Laura Osterlund play, and you'll wish you'd paid more attention in elementary music class! What do you get when you employ two creative Frenchmen as the resident artists of your 17th century court? With some luck, you'll get the Baroque oboe. Explore the "leading reed" with Sung Lee! Love glue: two words you never thought you'd see together in classical music. But, there they are. Find out what that actually means, and meet our traverso player, Leighann Daihl Ragusa! It kind of looks like a cello... only it's not! It's called a viola da gamba, which means "leg-viol." Come explore this beautiful and versatile instrument with BBE artist and Chicago favorite, Anna Steinhoff. Once upon a time (c.1500) in a land far, far away (Italy), a maiden named Isabella d’Este made the purchase of a lifetime in c. 1500. You probably guessed it: the violin. Explore that purchase, and how the violin has evolved since the 16th century, with BBE Artistic Director, Brandi Berry.